Titan Wraps is a recommended source for vehicle wraps in Carrollton TX, Dallas TX, DFW, Frisco TX, Lewisville TX and Plano TX. They specialise is vehicle wraps and graphics. Wraps and graphics is all they do and that is why they are so good at it. They can wrap any type of vehicle including cars, vans, trucks, trailers, buses and even boats. 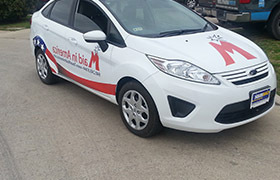 So if you want your vehicle to be a mobile billboard for your business, then vehicle wrapping is the way to go. Your vehicle will get seen my many. But you want it to be noticed. In order to get noticed you need an innovative wrap. For example if you are a plumber, then wrapping your service truck will certainly get you noticed and generate inbound inquiries and business. You can turn your car, service truck or delivery van into a mobile marketing machine that will help etch your business and services in the minds of many. You can decide between full wraps, partial wraps or lettering only. Which type of vehicle graphics will work best depends on your type pf business and the market are trying to reach. Vehicle wrapping is affordable and effectively pays for itself many times over. It also does take more than a day or two. The process starts with initial consultation and design. Once the design is approved the wrap is created on premium vinyl using high-tech printing and format equipment. A clear laminate layer is the applied to the wrap. This provides protection and durability. Next, they will prepare the surface of your vehicle so that it is ready to receive the wrap. The wrap and graphics with high precision and superior adhesion. In addition to vehicle wraps, the team at Titan can help you with floor graphics, store front graphics, wall murals and more.